Three teenage girls searched for jewellery after tricking their way into a Warwick pensioner’s home on the pretext of collecting for a charity for deaf youngsters. The three then targeted other pensioners, giving the impression that they were deaf and dumb – but were caught after one of their victims later saw them talking together. And at Warwick Crown Court the three, who had travelled from their homes in Birmingham to carry out their scams, pleaded guilty to a charge of burglary and three of fraud. Dorinele Barbu, 19, of Alum Rock Road, who also admitted attempted theft from another victim in Leamington who has cerebral palsy, was jailed for two years. Her two 17-year-old accomplices, also from the Alum Rock area of Birmingham, were both made subject to youth rehabilitation orders for 12 months, with various programmes, and made subject to electronically-tagged curfews from 9pm to 7am for four months. Prosecutor Stuart Clarkson said that on January 18 the three teenagers, who sat in the dock with a Romanian interpreter, travelled to Warwick by train. When the trio were arrested they had a total of £106 on them, but on seeing the form they had used Recorder Christopher Tickle observed that it ‘indicates rather more than £100’ had been obtained by their scam. 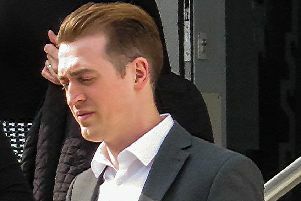 Mr Clarkson added that one of the 17-year-olds had convictions for theft in 2015 and false representation for which she had been given a referral order just nine days earlier, but Barbu and the other girl had no previous convictions. Sentencing the three, Recorder Tickle told them: “You all, I trust, are totally ashamed of everything you did. “This was an extremely nasty, unpleasant and pre-planned operation.